It's almost 100 percent genetic, but there are successful treatments available. Siri... is it just me or does my hair look thinner? However, that's not to say you are powerless to stop the process, with treatments available to combat balding (as well as to stimulate hair growth) which have proved largely effective. But what is the deal with hair loss in the first place? Why does it happen, how can we stop it and does it differ between men and women? The Huffington Post Australia spoke to Professor of Dermatology at the University of Melbourne and director of Sinclair Dermatology, Rodney Sinclair, to find out. "Of all the genetic traits -- height, weight and so forth -- baldness is one of the few which is 80 to 90 percent genetic, and only 10 percent environmental," Sinclair told HuffPost Australia. 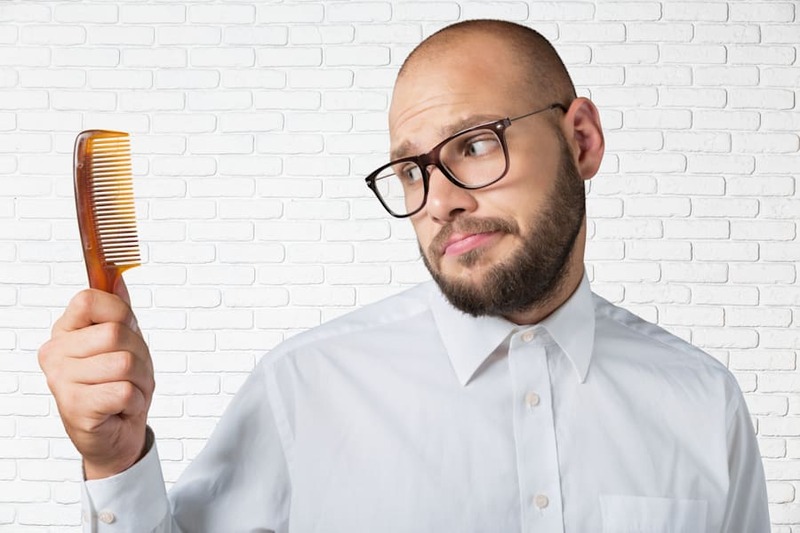 In fact, when it comes to male pattern baldness, the trait is so ingrained in your genetic makeup, identical twins will go bald at the same age, rate and pattern irrespective of their diet or lifestyle. As for how it works, in males, you can compare the process to a teenage boy first growing facial hair (though of course, when it comes to baldness, it happens in reverse). "Someone with a full head of hair might have big hair follicles, which produce big thick, pigmented hairs," Sinclair said. "When someone starts losing their hair, these follicles essentially transform into tiny little follicles. "Think of the the upper lip of a teenage boy. A boy starts off with tiny little hairs which are almost invisible -- those tiny, wispy little hairs -- which eventually grow stronger and larger until that boy has a full beard or mustache. "Interestingly, the same process is happening in the exact reverse on scalp." 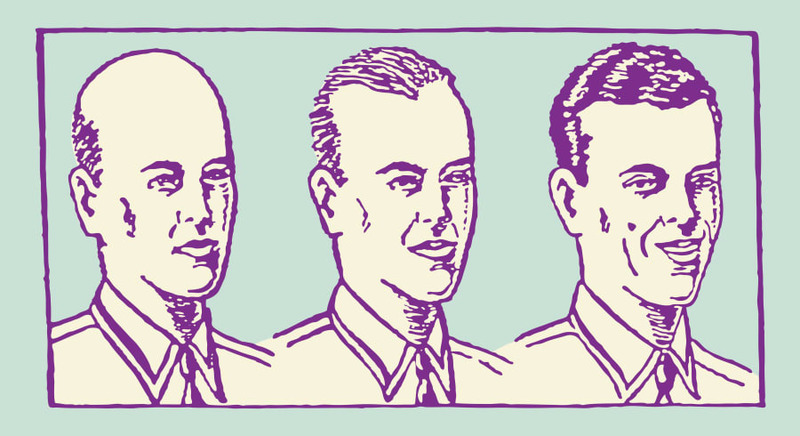 A helpful diagram of a man in the varying stages of baldness. In terms of exactly what is causing this to happen, the basic gist is that androgen [male] hormones can (and do) bind to receptors in scalp follicles. 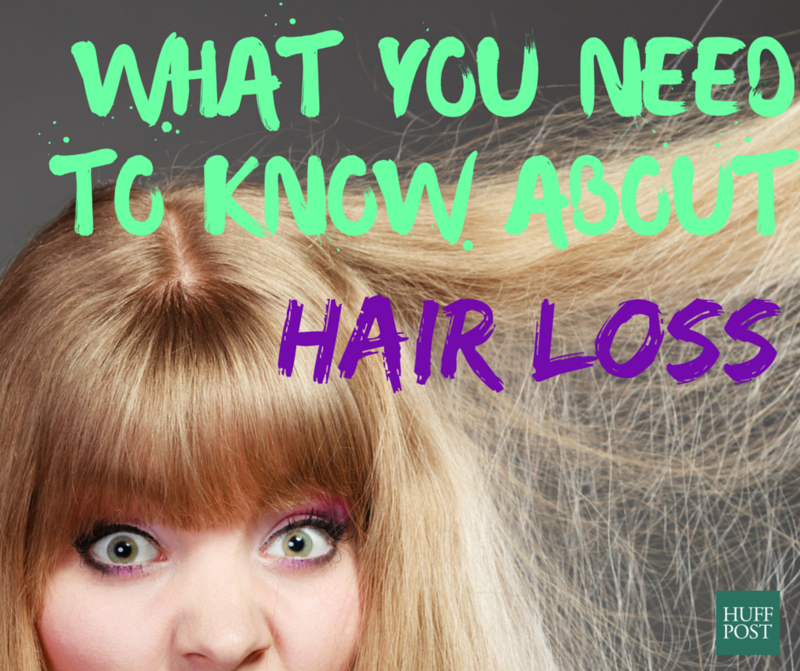 This process is essentially what causes the hair follicles to shrink, making it impossible for healthy hair to survive. Or, in Sinclair's words: "What we do know is the androgen hormones binding to the androgen receptors is what stimulates hair follicle minimisation." 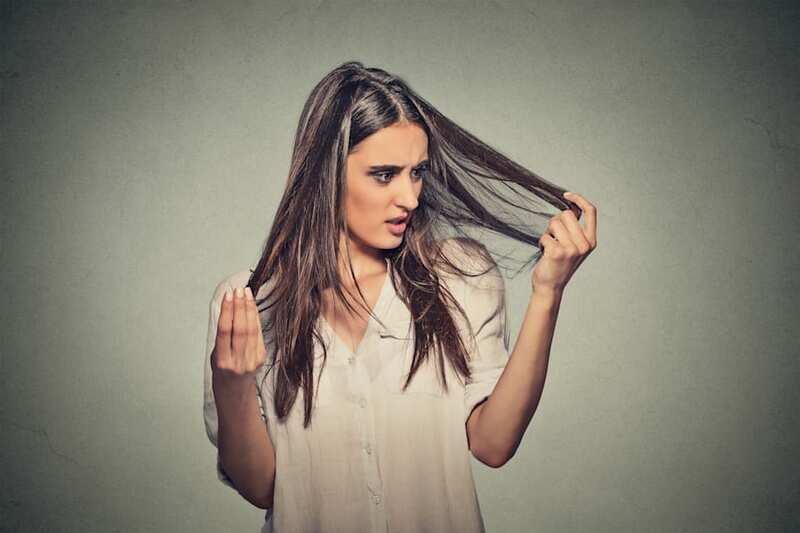 Female pattern hair loss (FPHL) is also a genetic trait -- one which, according to Sinclair, almost 60 percent of Australian women are predisposed to. While hair thinning/hair loss may affect women differently to men (more on that later), the cause behind it is essentially the same. Basically, FPHL occurs when a woman who is already predisposed to the condition (thanks, Mum and Dad) is exposed to androgens. (Just because androgens are male hormones, it doesn't mean women don't have them). Much like in men, those pesky, hair-hating androgens then minimise susceptible scalp follicles until they become so small they are no longer able to support normal hair production. Interestingly, even bald men should have no issue with growing a beard. How do I know if it's happening to me? Well, we don't know how to put this delicately... but you will wake up one morning and all your hair will be gone. Hair loss is an ongoing process that presents differently in men and women. For men, they are most likely to first notice a thinning of hair at the back of their scalp and above the temples. 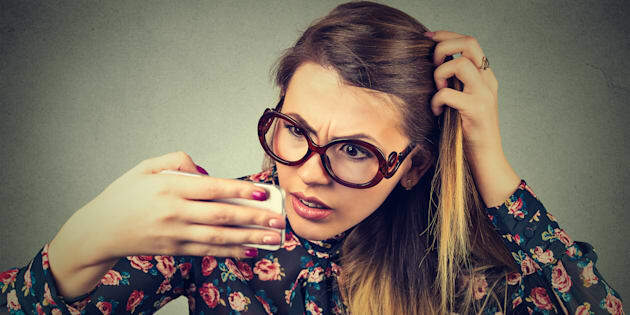 "Female pattern hair loss begins with diffuse thinning over the top and front parts of the scalp, most noticeably in the centre," Sinclair wrote in an article published to his website. "While the hair loss is most pronounced on the crown, hair can also thin from ear to ear. The back of the head is least affected." Many women with FPHL will notice they are shedding an increasing amount of hair or that their hair has reduced in volume or has less body. Women who have long hair may notice their ponytail becoming thinner. While shedding hair is completely normal, many women with FPHL will notice they are losing an increasing amount. Luckily, there are a host of successful treatments out there on the market which can assist in preventing hair loss as well as stimulating hair growth. It's extremely important to note that time is of the essence when it comes to treatment: the sooner you start, the better results you'll get. For women, the process is somewhat simpler as they can simply take oral anti-androgen medication, which basically block the effect of androgen hormones. (Note these should not be taken if the woman is pregnant). According to Sinclair, there are also a number of a number of shampoos and conditioners on the market which can reduce hair loss and promote regrowth. In men, hair loss is often first noticeable around the temples. 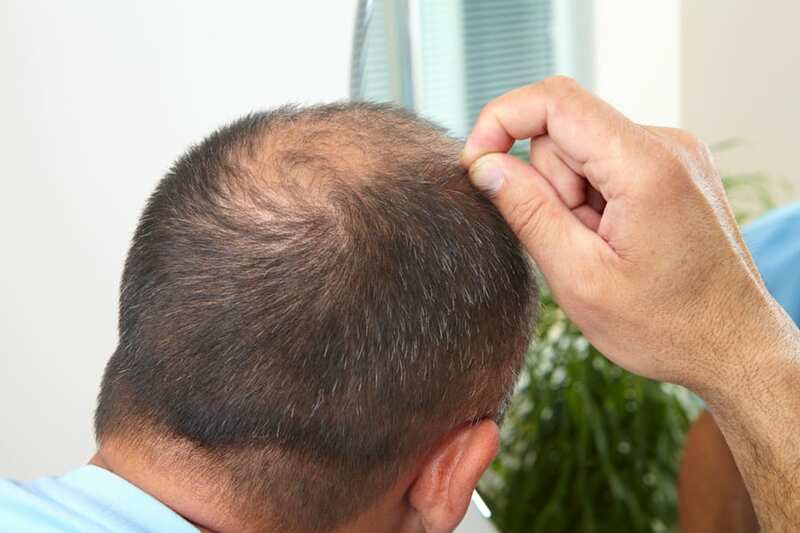 For male hair loss, the prescription drug finasteride has been used for over 15 years and essentially works by "stopping the conversion of testosterone to dihydrotestosterone in the prostate, by blocking an enzyme called 5-alpha reductase." Or in other, non-scientific jargon-y terms, it stops testosterone from being converted into a more active by-product dihydrotestosterone (DHT) which has a more profound effect on the androgen receptors. By using finasteride, Sinclair says "you can block the conversion of testosterone to DHT, which is enough to stop the badness without emasculating men." While Sinclair notes stopping the DHT production is enough to stop balding process in 98 percent men, around one in 200 taking finasteride may notice a reduction in their libido. Minoxidil is another available treatment, originally developed in the 1950s as a tablet to treat high blood pressure. It is used as a lotion applied straight to the scalp and is "available over the counter in pharmacies for between A$15 and A$60 per month, depending on the brand". 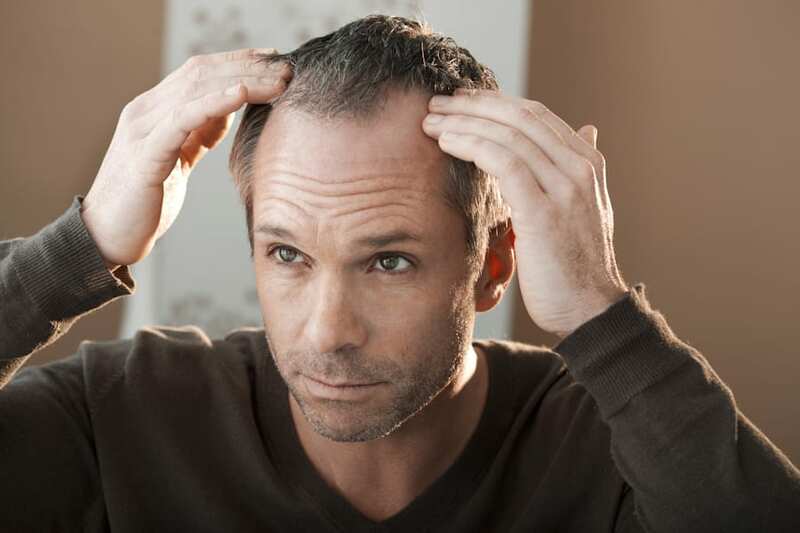 The other place men might initially notice hair loss is at the back of their head. "Minoxidil is moderately effective.It's nowhere as near as effective as the tablet but for some people, it will stop the hair loss and stimulate hair to regrow," Sinclair told HuffPost Australia. "There are also some complaints because it is put in a base that makes the hair look oily and sticky. For those attempting to grow more hair, it can make their hair look worse," Sinclair continued. "I have seen people take it for years and years with success, but many more than that found it too time consuming or didn't like the look or feel. In short, they would rather go bald than continue using it." In terms of how the treatments compare, Sinclair sums it up best on his website. While finasteride works best at arresting progression of genetically programmed hair loss, some men will achieve partial regrowth. The sooner you begin treatment, the more hair there is to protect. Minoxidil is better at stimulating new growth rather than preventing progression. A bit like the bank manager who lends an umbrella when the sun is shining, and wants it back when it starts to rain, minoxidil works better before you go bald. Men who still have hair regrow more hair than men who have lost it all. When used together, the combination of minoxidil and finasteride is a man's best chance to both arrest hair loss progression and maximise hair regrowth. There are also numerous treatments currently being trialed for wider use or, in more extreme cases, someone may consider (the much more expensive) options of hair transplant surgery or follicular unit extraction. If you are worried about hair loss, go and see a dermatologist who specialises in the area, or visit a hair loss clinic. As is the case with many things, when it comes to hair loss, prevention is easier than the cure, so if it's something you're concerned about, it's better to act sooner rather than later. And always seek medical advice before undertaking treatment.